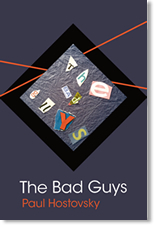 Who are the bad guys, anyway? Which one is the good fight, anyway? In Paul Hostovsky’s eighth book of poetry, The Bad Guys, there are poems about suicide bombers and high school bullies, capricious exes and ecstatic bums, fastidious drug-dealers and contemplative alcoholics, evil stenches and spiritual moms; poems about the Republicans, the mega-hospitals, the brusque and bearded anesthesiologists, and the lady who gave out pencils on Halloween. Plus a host of other unlikely, often likable, always loveable, candidates. These poems are by turns funny and poignant, formal and free verse, a villanelle here, a pantoum there, and lots of loosey-goosey sonnets peppered throughout. Buy the book on Amazon.com. Read 3 poems from Naming Names. Read 3 poems from Hurt Into Beauty. Read 3 poems from A Little In Love A Lot. Available for purchase from the publisher or the author. Email Paul for details. "Paul Hostovsky has the storyteller’s gift for character and voice. He has the lyricist’s gift for extracting the essential moment, holding it up like a crystal, and making it sing. He brings us into a world where beauty and pain reside together. From the shards of illness, addiction, and fractured love affairs, he meticulously crafts poems that are significant and durable." "Although the title poem is a sort of Dear John letter to Truth, the book itself is, in fact, dedicated to truth on a larger scale: the expansive and various truth of the imagination. 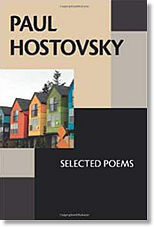 In these touching, finely crafted, and often funny poems, Hostovsky remains true to his lively and inquisitive vision of the world, to beauty, joy, pain, and grief, always displaying a love of language that is contagious and invigorating." Read 3 poems from Dear Truth. Read three poems from Bending the Notes. Read three poems from Bird In The Hand. Available for purchase from the author. Email Paul for details. "Paul Hostovsky negotiates a territory not far removed from the casual speaking style of Frank O'Hara, and the humor and simplicity of Paul Zimmer, but he is not a mere hybrid of these two fine poets. He represents what is best about clarity in poetry. He never overwrites, or tries to force his "lyrical" soul on a situation or perception, but lets the situation and perception offer up their own "poetic" moments. I found his writing to be both humorous and precise, yet free flowing--the triumph of a center fielder who has learned to make the hard catch look easy." Read three poems from That Light. Read three poems from Dusk Outside The Braille Press. Read three poems from The Best Lunches. "They are slyly sonnets, these delightfully pithy little narratives that have the relaxed quality of conversation, are always more formal than they appear, but without ever losing that improvisational effect. They shock with little explosions of insight, take unexpected turns that rivet the reader's attention. I read them straight through from cover to cover!" Read three poems from Sonnets From South Mountain. Masthead image: "The Cathedral" by Auguste Rodin. Copyright January 2007, Paul Hostovsky - All rights reserved. Website design, Meredith Andrews.